Selection of a Wide Range of Lubrication Conditions by Microcomputer Control | Overview | Daikin Lubrication Products & Engineering Co., Ltd.
A wide range of lubrication conditions can be selected by microcomputer control. 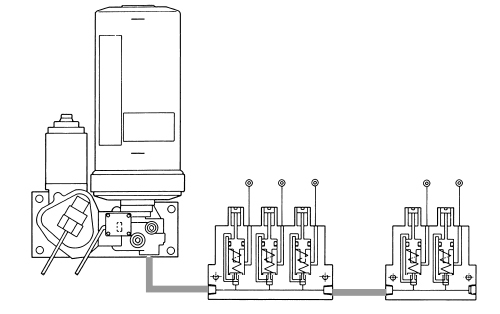 The LUBMAX system can be easily configured as it consists of very simple piping that connects the pump to the distributing valves by means of a single main supply line. Each of the distributing valve elements performs the “pump pressurization - lubrication - pressure retention (lubrication) - depressurization (filling)” lubrication cycle independently and in parallel to ensure accurate reliable lubrication. A wide range of lubrication conditions can be selected according to specific work content by the LUBMAX system exclusive microcomputer type controller. Operators are allowed to select between fully automatic lubrication operation or arbitrary lubrication operation. Adoption of a grease cartridge enables grease to be replenished and replaced easily by one-touch operation. This is the standby state position without pressurization from the pump. The P line is pressurized by pump operation to push the pilot piston, and grease passes through the pilot passage to be transferred to the metering piston right chamber. (1) The metering piston is pushed to discharge the grease in the metering chamber. (2) At the end of this stroke, the pilot piston is pushed back, and the P line and pilot passage are closed. When the pressure of the P line is released by movement of the depressurizing piston, the metering piston is returned to the right side by the force of the spring. 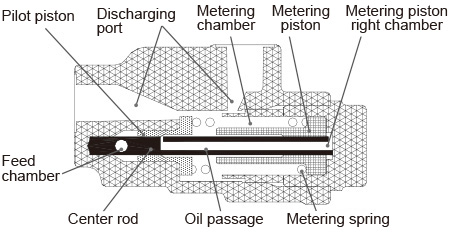 At this time, the grease at the right bottom of the metering piston is transferred to the inside of the metering chamber from the groove at the spring receiving end.